Home > Comet Clutches and Parts > Comet 302245A - 500 Series Drive Clutch. 3/4” Bore. Comet 302245A - 500 Series Drive Clutch. 3/4” Bore. Comet 302245A - 500 Series Drive Clutch. 3/4” Bore. 7/8” (.92”) Top Width Belt Drive Unit. Engagement: 2100 RPM (approx.). 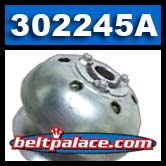 500 Series, Comet Industries 302245 A.
Comet 500 Series 3/4” Bore Torque Converter System (Symmetrical). 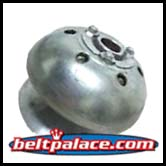 Comet 300668 (A-DF) Go Kart/ATV Belt is exact replacement for Comet Industries belt 300668a. Replaces OEM 500 and 858 Series belt. Drive belt for Brister’s Chuck Wagon (CW-11 and CW-13) and Land Master with Comet Industries Torque Converters. Comet 300668-A - Kevlar cord backing provides affordable quality. Made in USA by Comet Industries!